Last weekend, I posted the recipe for German Poppyseed Crescent Rolls, which is a medium-difficulty level bread to bake. If you are new to making homemade bread, the easiest bread recipe is homemade foccacia. The dough is actually just a standard pizza dough recipe, but it's allowed to proof for a couple hours to achieve a light, fluffy bread dough. The pizza dough recipe is my dad's, who is a chef. We rarely ordered pizza when I was growing up, because he often made pizza from scratch. People are always so impressed by a fresh baked loaf of foccacia, because most people have never attempted to bake bread, they think it must be quite challenging. This recipe is quite simple, and it doesn't include eggs or dairy like a lot of other bread doughs, so it's allergy friendly. I top my foccacia with dried rosemary and thyme to match the flavours in my homemade chicken & rice soup (scroll down for the soup recipe here). If I don't have a turkey carcass with which to make soup, I just buy a rotisserie chicken from the grocery store, we eat the breast meat for one meal, allow the chicken to cool, then I pick the dark meat off the bones and save some of the larger bones to make soup. It's a bit of a cheat, but it makes a great soup! The foccacia is a perfect pairing to a bowl of homemade chicken soup on a cold winter day. In 1 cup of warm water, pour packet of dry instant yeast and add granulated sugar to the water and yeast. Allow yeast to sit for 5 minutes. During that 5 minutes, measure out AP flour, salt and olive oil and add to stand mixer bowl or large mixing bowl. Add water and yeast mixture to flour mixture and knead with stand mixer or by hand. If using a stand mixer, put on lowest setting with dough hook for 5-7 minutes. Dough should form into a smooth ball. Place the dough ball into a medium sized bowl and cover with a clean kitchen towel. Place the covered bowl in a warm place (on sunny days, I place it on the windowsill) for one hour to proof. After one hour, punch down dough and line a baking sheet with parchment paper or aluminum foil greased with canola oil spray. Using hands, press dough out into an even oval shape on the baking sheet. Cover the dough once more with the kitchen towel and place in a warm spot to proof for one more hour (if the kitchen is cold, turn the oven light on and place in the oven for 1 hour--the heat from the light will help the dough rise). 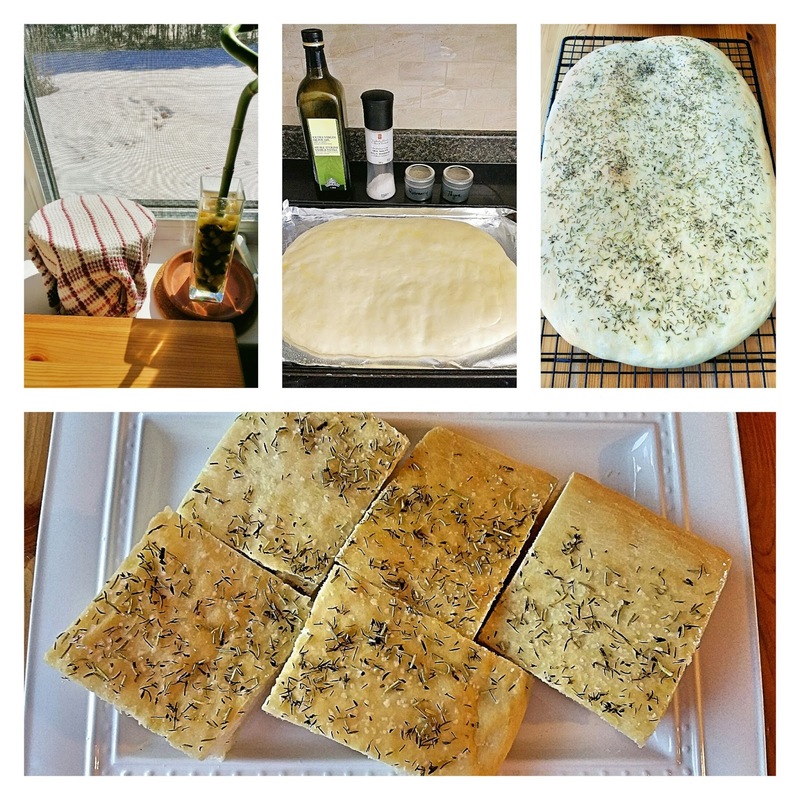 Preheat oven to 375 degrees F. Drizzle olive oil on top and use the back of a spoon to spread oil evenly to coat the dough. Sprinkle with rosemary, thyme and sea salt. Bake for 16-17 minutes, until dough is lightly browned. Cut into squares and serve with olive oil and balsamic for dipping. Note: Fresh bread does not stay fresh for long, so if you are not planning to eat it the day it was baked, store in a tupperware container or an extra large freezer bag to maintain freshness.